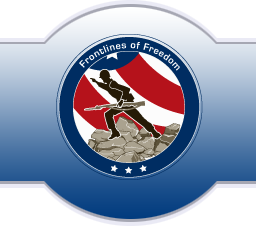 Frontlines of Freedom is a web site and radio show for military members, veterans, and their families. It is not commonly known that the size of the United States Armed Forces is limited by Congressional mandate. The Army is currently only allowed to have 514,000 soldiers — as opposed to the 1.6M soldiers the Army was allowed during the Korean War. These limitations, and the increased demand for our worldwide peacekeeping efforts, have forced the armed forces to call upon the men and women of our armed forces to serve extended and repetitive deployments overseas. This creates hardships not only for our service members, but also for their families. Our service members always need our support, but they need our support now more than at any time in recent history. Frontlines of Freedom is broadcast on Wood Newsradio 1300 and you can listen the station online over the Internet here.